Finally, a cake as unique as the person you're making it for, right? Seems like the world is unicorn-everything right now — and with good reason! Who can resist the sparkly colours and swirls of silver and gold? 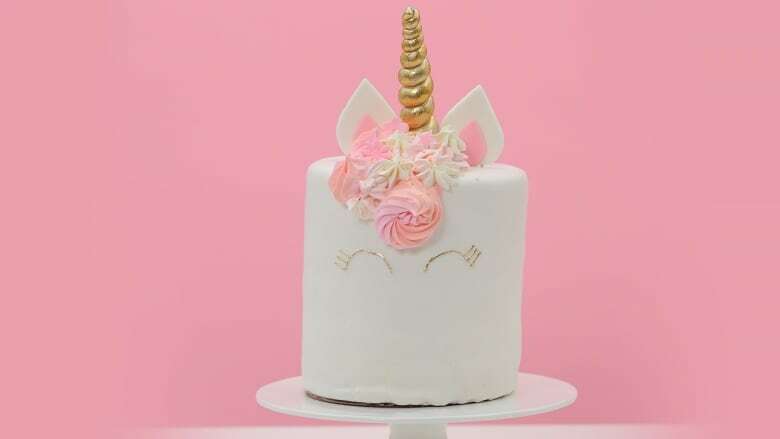 Amp up the whimsy with this adorable enchanting unicorn cake — complete with glittery horn, flowing mane, and shimmering sparkles! We’ll show you how to craft this mythical masterpiece from scratch — no magic necessary. Begin assembling your cake. Bake three separate cakes and begin icing and layering them to make a three layer cake. Pipe the cake with frosting and smooth it out evenly using a spatula. Begin rolling your white fondant. Once you have flattened it out, roll the fondant on the rolling pin to keep it even and gently layer it on top of your frosted cake. Press it down to the sides to form to the cake’s shape. Use a knife to gently cut off the excess. Smooth down the top and sides of the cake. Use your variety cutters to cut out a medley of small pink fondant cutouts. Cut out two small pink teardrops and two large white teardrops. Add a drop of water to the pink teardrops and stick them onto the white ones. Stick two toothpicks into the bottom of each one. Roll some white fondant into a long snake — tapered slightly at one end. Cut it down so that it can be rolled around your skewer, leaving a little bit of the skewer bare. Slightly wet your newly-made unicorn horn with some water and brush some edible gold glitter. Use your rose piping tip to add some frosting roses to the top — switch up which shade of frosting you use to create a beautiful floral effect (this will be the unicorn’s “hair”). Pop some more fondant cut-outs on there and sprinkle some more edible gold glitter around it. Time for the final touches! Paint some edible glue in a light curve to create eyes — add some eyelashes at the end. Paint edible glitter over the glue to make the eyes and lashes pop with cake. Time to bust this out at the party with some champagne or a delectable milkshake — perfect for unicorns of all ages!